Tracking Progress is an extensive research report on the rising trend of activity trackers circa 2013. The research began with an office-wide experiment/competition to study the effectiveness of the most popular options for trackers at the time. 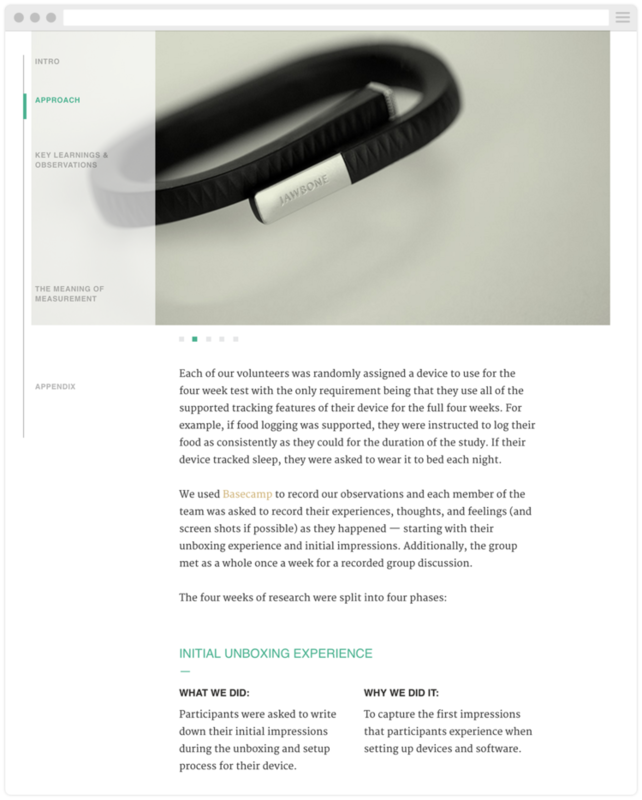 15 of us wore our own trackers for one month and documented our experiences, thoughts, and impressions along the way. Justin Spohn collected the wealth of feedback and synthesized it all into a comprehensive writing piece meant as a resource to anyone online looking to find qualitative findings across the spectrum of offerings in the market. A website was designed and developed to house the report. Alongside our web developer and with the assistance of our senior designer, I helped establish content flow, site navigation, art direction for photography, charts and graphs, and section bookend visuals. The site can be viewed in its live format here.